Yet another blog post related to my recent visit to Shanghai. You might remember the Chung Hwa Drawing Pencil 101, together with the Chung Hwa 6151 it forms the pencil backbone of Shanghai. 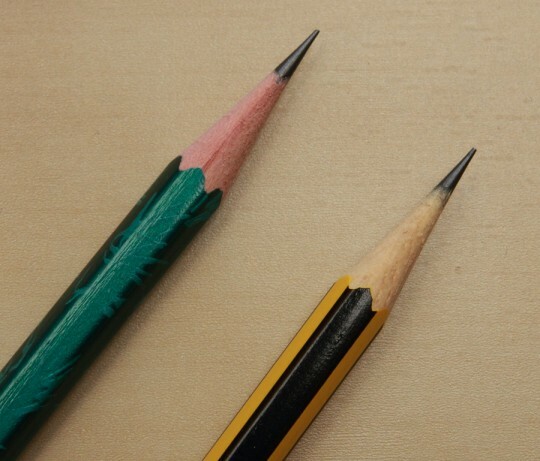 Whenever you see a pencil in Shanghai it usually is one of these two – and they are made in Shanghai, too. …but what happened? Deli dared to enter Chung Hwa’s home turf – disturbing the natural order of things. 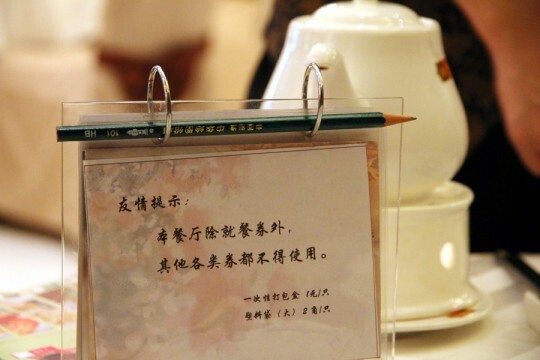 …and what a pencil they sent to threaten Chung Hwa’s hold on its home territory: it’s the Deli No.70831. 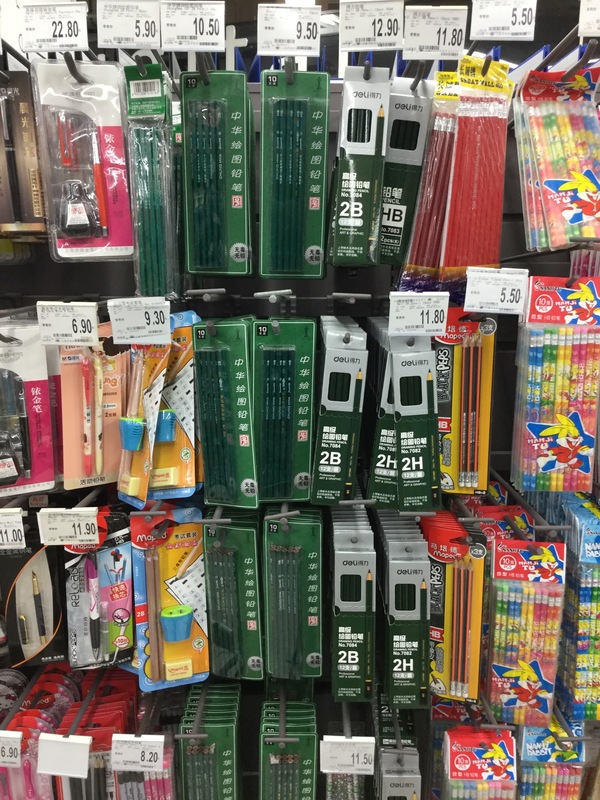 I bought the 7083 in the Carrefour in Shanghai’s Hongkou Dragon Dream Shopping Centre and paid 11.80 元 (~$1.80; £1.25; €1.65) for a dozen HB pencils. They were also available in 2B and 2H. Let’s look at the appearance first. The 7083 looks like a pencil with a very thick layer of paint. The paint seems to be applied very well, except near the end of the pencil, which seems to have been dipped in just a bit too much paint. 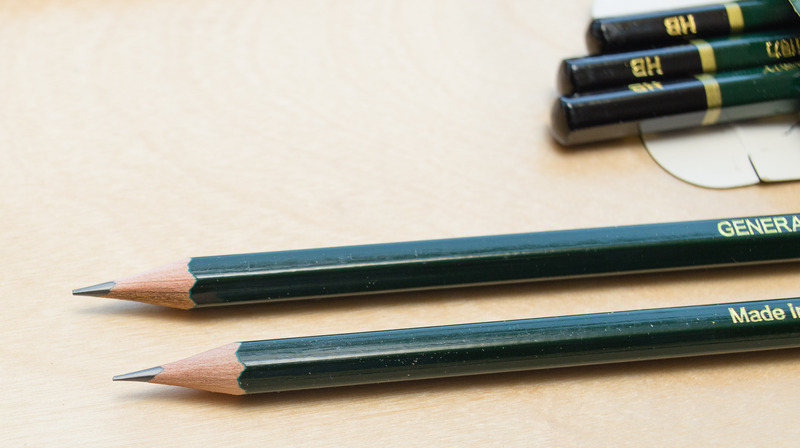 The 7083 has an unusually large diameter for a modern pencil. The paint job and the large diameter make it feel like a much better pencil than what you’d expect from a pencil with this price tag. 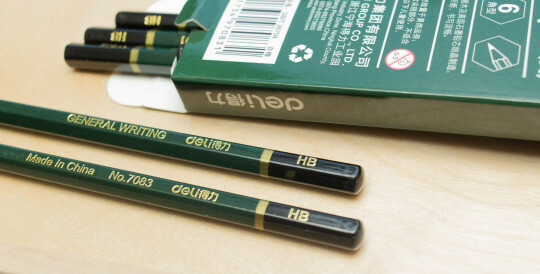 It is dark green like the Chung Hwa 101, but there’s also a similarity with another pencil. The shade of green used is virtually identical to the one used for the Castell 9000. The 7083 lays down a very dark line and feels very smooth, even creamy when writing – but just to put this into context, we are talking about a very cheap pencil. The 7083 is not as good as the big boys, like the Mars Lumograph. Nevertheless it is very good and probably the best pencil I have tried in this price range. If I had to compare to a pencil that is well known I would compare it to Staedtler’s Mars Lumograph in B. Point retention is very similar, but in direct comparison it is ever so slightly lighter than the Lumograph in B and slightly less smooth and erases slightly worse than the Lumograph in B2. It writes well even on paper that is not good for non-soft pencils, like the original (‘Kraft’?) Field Notes. The wood is slightly red, similar to the one used for the Chung Hwa 101 and when you knife sharpen the 7083 you notice that the wood is harder than cedar wood. A great pencil that is nearly as good as much more expensive pencils. It has a strong paint smell, similar to other Chinese pencils, but for this price you probably won’t be able to find a much better pencil. Please open images in a new tab/window to see them at full resolution. For me the Staedtler Noris has always been the archetype of a pencil. The Mars Lumograph might come close and these days I might also consider the Castell 9000, but somehow I never really saw the Castell 9000 being used around me when I was younger. My father was a joiner, so he used carpenter pencils and normal pencils …and because he used a lot of them he would not buy the more expensive ones. There was a point, I think it was the early nineties, when Herlitz Scolair pencils became quite cheap. So he usually used those …and he used a lot of them. Even though I also used to use them I never thought of them as nice pencils, they were always just cheap pencils to me. In the eighties there were of course Japanese pencils in Germany, too, but they were usually novelty pencils, not branded pencils. 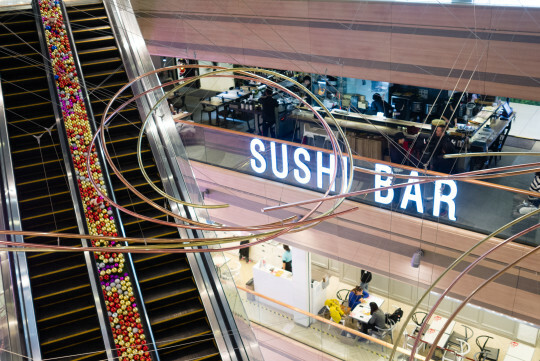 Their selling point would be the unusual look, e.g. unusual patterns or colours printed on them, often metallic. Unfortunately they usually suffered from lead breakage, probably because the manufacturers did not have to try hard: Everybody who bought them did so because of how nice they looked, not because of their reputation – and since they were not branded you could not really know which ones to avoid in the future . 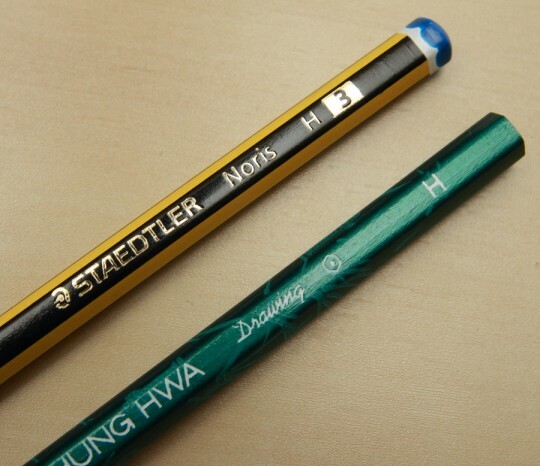 Back to my original topic: I think the Staedtler Noris can be seen as the archetype of a pencil in the UK and in Germany. In the UK the Staedtler tradition can also be seen quite often, but in both countries the Noris seems to be the pencil that is most ‘common’ and recognisable the same time. Last time I was in Shanghai I was trying find the Shanghainese equivalent by looking for the most common pencil in everyday life. 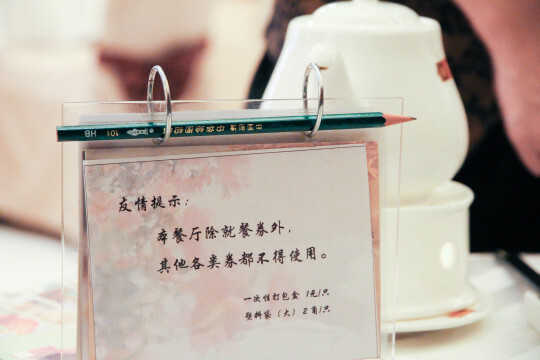 I expected it would be the Chung Hwa 6151, just because it was a Shanghainese pencil you come across in stationery blogs or web sites, but I never really saw the 6151 in the wild. Instead I came across the Chung Hwa Drawing Pencil 101 again and again. Employees in supermarkets used it to make notes. Waiters in restaurants used it to take orders. It just seemed to be the most common pencil in Shanghai. If there are any reader who know or live in Shanghai and disagree please let me know. I would like to know what your experience is. China First Pencil Company Ltd.
Before I go into more detail about this pencil I would like to talk about the manufacturer, Chung Hwa, first. 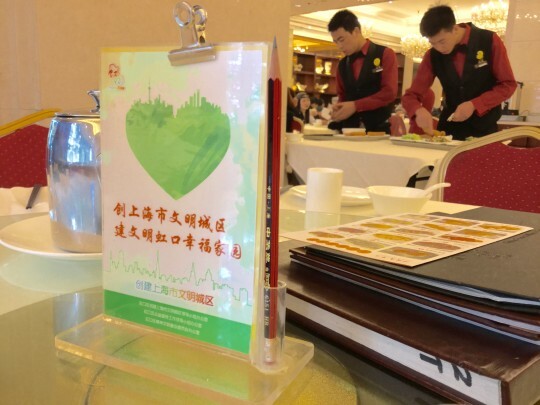 There are many Chinese companies and products in different and unrelated industry sectors that are called Chung Hwa: there are Chung Hwa cigarettes, cars, there is Chung Hwa cognac, ink, etc. As far as I can tell these companies have usually no connection except the common name. Chung Hwa (PinYin: ZhongHua) does translate as ‘China’ but not in the normal sense, i.e. when you talk about the country, but in a cultural or literary sense. The Chung Hwa pencil company traces it roots back to 1935. It changed the name a few times and today’s official name is China First Pencil Company Ltd. They manufacture graphite, colour and cosmetic pencils as well as pencil related stationery and machines for the pencil industry. 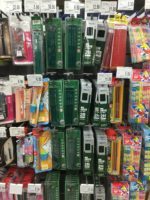 Prices for a pack of 10 Chung Hwa 101 Drawing pencils start at 6.50 RMB (97¢, 61p, 70c) but usually they are quite a bit higher. The look of this pencil seems to have changed dramatically over time: In the past there was one version of this pencil (i.e. same name and model number) that looked like a typical Mars Lumograph copy. The article number of Chung Hwa’s pencil with the Mars Lumograph look (Google translation of the linked page) has however changed from 101 to 111, and you can sometimes even find this pencil in supermarkets in the West. 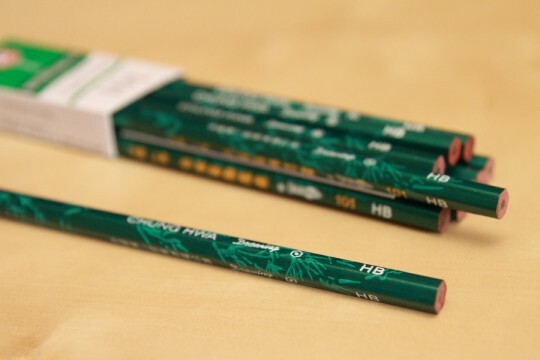 Today the Chung Hwa Drawing pencil‘s body has a dark green body colour with a light green pattern of bamboo leaves and totems printed over it. The pencil is hexagonal without a painted cap and is labelled on three sides. The wood used is rather red, but does not seem to be the Vatta wood (Macaranga Peltata) mention in a previous blog post. Two sides are labelled in white, one in white and gold. As far as I know the Chung Hwa 101 should be available 6H – H, F, HB, H – 6H. Despite my best efforts I was however unable to find this pencil in F, so I bought one pack in HB and one in H.
Since this pencil seems to be Shanghai’s everyday pencil I thought it would be a good idea to compare it to what I think is the UK’s and Germany’s everyday pencil, the Staedtler Noris, as explained earlier. Let’s start by looking at the finish. I like the fact that you can see the wood grain through the paint, but on the 101 the paint has not been applied as well as on the Noris. This applies to both the dark green base and the light green pattern. 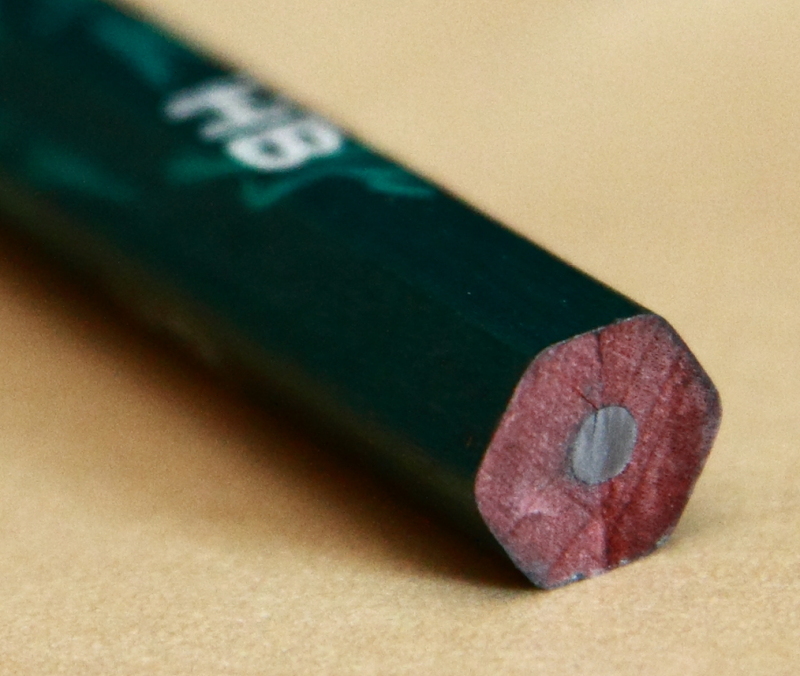 The Chung Hwa Drawing Pencil 101 in HB is also not as soft and smooth as a Noris HB. It is not yet scratchy and certainly not worse than an average pencil. 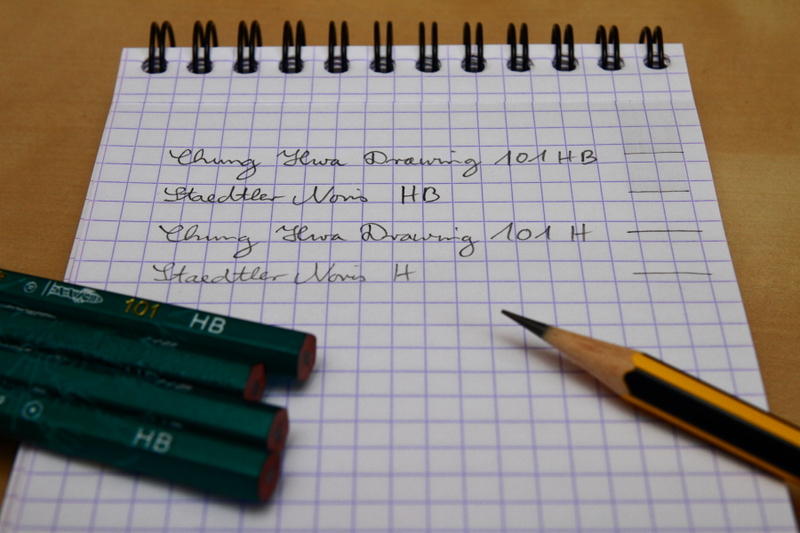 The graphite is not too reflective and does not smudge, so keeping the price in mind the 101 HB is very good value for money. The 101 in H is also very good for the price, but compared to the Noris in H it is much softer, more like an F grade pencil. The Chun Hwa Drawing Pencil 101 offers very good value for money. It is not really a great pencil that can compete with good pencils, but it is definitely better than the average no name pencil and better than many cheap branded pencils. As usual: the paper that can be seen in the comparison photo of this blog post is the Bloc Rhodia Nº 13.